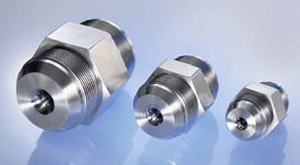 Critical Flow Venturis and Sonic Nozzles are fluid flow measurement devices used in a number of industrial and scientific applications. 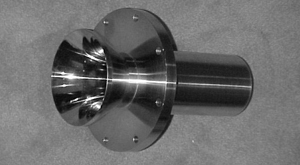 Due to their high repeatability and reproducibility, they are considered to be very precise. Sonic devices operate on the principle that as fluid flows through the meter; the fluid accelerates as it approaches the throat. As the differential pressure increases, the velocity at the throat increases. When the velocity of the fluid reaches the local speed of sound, it is considered choked, sonic or critical. Once the flow has reached the critical state, increasing the differential pressure will not affect the fluid flow rate. Several components are important to a sonic device metering system; upstream and downstream piping, pressure sensors, temperature sensors and flow computers. CEESI uses Critical Flow Venturis and Sonic Nozzles in our laboratories as transfer standards for calibration. When used in compliance with standards, it is not necessary to calibrate CFVs, and the typical uncertainty of a critical flow venturi metering system is on the order of 0.5-1.0%. The uncertainty of a sonic metering device can be reduced by calibrating the meter. Calibrated meters can have the uncertainty reduced to approximately 0.1%. Request a quote or contact us if you have questions about CFV/sonic nozzle calibrations. Throughout the year, we offer several training courses that specifically address CFVs. Check out our list of events for flow courses that would be convenient for you or your organization. We have invested considerable resources into creating the Flow Measurement Technical Library so that could be a useful resource to the flow measurement community. There are free downloadable papers and abstracts from a variety of organizations relating to CFVs/sonic nozzles. This library contains over 68,000 documents from organizations including NIST, ISHM, AGA, ISFFM, ASGMT, FLOMEKO, MSC, AGMSC, WGMSC, ASME, NEL, and others. Search the Measurement Library for papers on critical flow venturis and sonic nozzles.